Today is July 31st, which means it is Harry Potter's (and J.K. Rowling's) birthday! 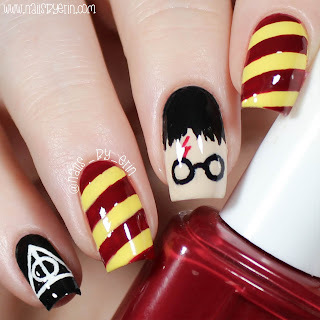 I am a huge fan of the Harry Potter series and the movies, so I wanted to do a design to celebrate. I decided on this super easy Harry/Gryffindor themed mani. Today I have a #SwatchSunday post for you guys! I feel like it's been a while since I did my last one, and I really want to have these as a regular thing on my blog every Sunday. If you're interested in purchasing this polish or any other products from Snail Vinyls, don't forget to use my code NAILSBYERIN for 15% off! Shark Week Nails & Live Love Polish "Shark After Dark" Review! 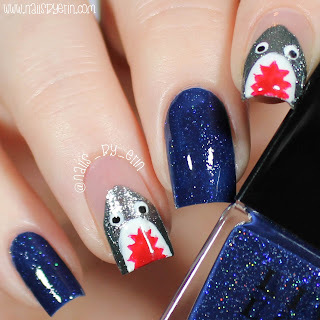 I wasn't sure whether or not I was going to do nails in honor of this week, but after I got the LLP collaboration with Discovery Channel for Shark Week, I knew I had to do a mani with these polishes! The exclusive collection consists of two polishes, "Shark Skin" and "Shark After Dark", as well as holographic shark nail vinyls. The collection is limited edition, so be sure to get your hands on them before they sell out! And if you buy the whole collection before Sunday, you can get 15% off with the code SHARKWEEK! Today I have more nails to go with my new socks from Living Royal! When I saw these mermaid knee high socks online, I thought they were so cute! They have multicolored scales and even a fish tail at the bottom. 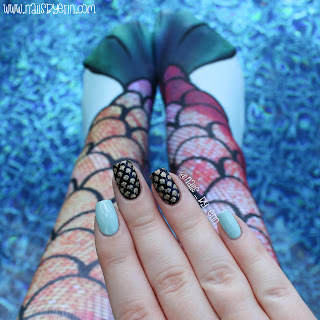 I immediately knew that I had to do some mermaid scale nails to match. Keep reading to see how I created this design!